Each month at the beginning of the meeting, we do a chant and shout “Shapa Mochudi Teen Club Shapa, Life Goes On… “ It took some pushing in the beginning to get it going, but now it comes naturally and is shouted with enthusiasm. 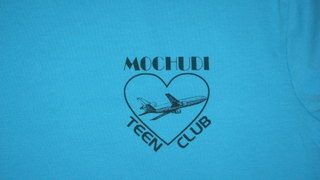 I was able to create the airplane in the heart symbol on the computer and have used it on the flyers we put in the IDCC (Infectious Disease Clinical Center) at DRM and other local clinics to advertise Teen Club. I also added it to the Stepping Stones letterhead and use it when I send out letters for Teen Club. Toward the end of 2012, the teen leaders brought up the T-shirts again. “Tish, you promised us T-shirts”, they confronted me. I asked them to design the shirts and it took them about 10 minutes to sketch out the placement of the symbol and the slogan. Now what? I had just been turned down by Baylor for funding for the Teen-Caregiver Communication Workshop. Where was I going to find money to pay for them? I knew Stepping Stones didn’t have extra Pula lying around. Within about 15 minutes, there was a response from my friend Brenda, telling me her family quit giving gifts years ago, and instead made charitable contributions to celebrate Christmas. She would suggest Stepping Stones this year. Tears welled up in my eyes. Amazing. A few days later, my daughter Betsy forwarded an email she sent to my family. She suggested they forgo the usual gift exchange and donate towards the t-shirts instead. Reply after reply came from my brothers, their wives, my niece and nephew all in agreement with her plan. WOW! Donations came from former co-workers, tennis team buddies, my ex-husband, his sister and many lifelong friends. There was even a huge anonymous donation! In the end, we raised more than enough money for the t-shirts. They were printed and ready in time for our first meeting of 2013. The theme of the January meeting was Adherence. We showed videos on how HIV affects the immune system and how ARVs work. Then the teens got in small groups and came up with the benefits of adherence, the consequences of non-adherence, barriers to adherence, and made a plan to achieve 100% adherence. We headed outdoors and had games. We did bobbing for apples to “take a bite out of HIV”. We also put kids inside hula hoops to represent the HIV virus and others threw water balloons at them as they moved across the field. The water balloons represented ARVS and a hit “killed the virus”. We finished the day by asking the teens to make a commitment to work towards 100% adherence in 2013. 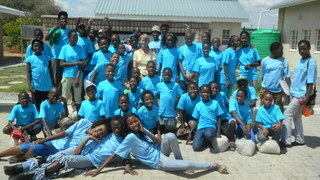 Each was presented with a T-shirt as encouragement to honor their adherence commitment. They were ecstatic to have the shirts and gladly posed for photos. I went home feeling good, and incredibly grateful to my family and friends for making the t-shirts a reality. Last week I ran in to one of the teen leaders at Spar, the local grocery store. He told me that the teen leaders had attended the Gaborone Teen Club the previous Saturday. They wanted to show off their t-shirts. They went and led icebreakers and attended life skills sessions. His eyes were sparkling and his smile was huge as he talked about how strong and full of energy we are, how our teens really pay attention during sessions, how much better Mochudi Teen Club is. “We showed them how it is done,” he said with pride. Saturday, February 2nd was the next teen club. I headed to Stepping Stones early to open up and get set up. As the teens arrived, it looked like a blue wave coming in to SSI. 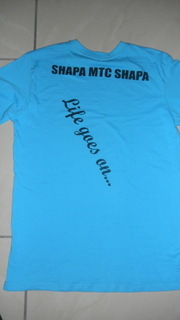 They had chosen blue for the shirts to represent hope. A mass of blue t-shirts descended on the center. The teen leaders jumped right in to start the icebreakers without any prompting. The meeting actually started on time for the first time ever! Kids without shirts came up asking for them. I told them they would get one, but later in the meeting. We had a 3 minute talk on adherence, then called those without shirts to come forward. We made them pledge to work towards 100% adherence and presented the shirts. This month’s theme was “Never Give Up, Never Lose Hope”. Again the teen leaders took over, followed our plan and pretty much ran the session independently. The kids were doing a time line to show significant events in their lives from birth to present, and then added on their dreams for what they wanted to accomplish by 2015 and in ten years in 2023. My heart ached as I heard them tell: this is when my mother died, this is when I got sick, this is when I came to teen club. But then it recovered as I heard one of the teen leaders share: I will be working with HIV positive youth in 2015, I will shoot my first video to help teens living with HIV by 2020. Other kids shared their stories, their hopes, their dreams. There seems to be an openness that wasn’t there before. There seems to be more confidence. Their bond to one another seems stronger. There is definitely more joy, more laughter. Something special is going on. I think those t-shirts are magic. This entry was posted in Peace Corps, Service - Year 2 and tagged AIDS, Botswana, HIV, Mobley, Peace Corps. Bookmark the permalink. I don’t think those t-shirts are magic. I think they are blessed! Always remember they came as a part of the celebration of the birth of the true giver and sustainer of life, the Lord Jesus Christ.